* The nomenclature given in this table and used in this communication differs in many details from the nomenclature recommended by the Illuminating Engineering Society and approved by the American Standards Association. 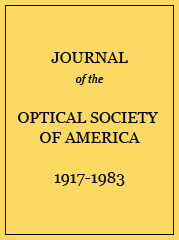 These modifications of the standard nomenclature were proposed by the Colorimetry Committee of the Optical Society of America (in 1937 and 144) as somewhat simpler and more systematic, with hope that they might be considered in any revisions of the standard nomenclature. The letter symbols shown in the table are identical with those adopted by the American Standards Association for the corresponding concepts. The symbol ω denotes a unit solid angle, the solid angle subtended by one square meter of the surface of a sphere having the radius of one meter. Luminance of the clear sky, winter and summer values. Luminance of the clear sky, average of winter and summer values. Illuminance due to direct sunlight, skylight, and total on horizontal and vertical planes. Data (from Fig. 16) illustrating the consequences of introducing a variable flare factor into Eq. (20a). Data (from Fig. 17) illustrating the consequences of using a fixed flare factor (FF=4.0) when photographing scenes in which the flare factor is variable. Values of illuminance (foot candles) on the normal plane and of luminous density (lumerg/cu. ft.) attributable to direct sunlight, skylight, and the total. Specification of the latitude bands for which the variations of solar altitude with hours of the day and month are computed. Solar altitude at various hours and months at latitude 40°N. Luminous densities at latitude 40°N. Consecutive whole numbers, column 3, which represent all values of light index, Lv, between the limits as shown in the first column and the corresponding values of luminous density, Column 4. Light indices for various latitudes, local solar time. June 0 0 0 0 1 3 6 Dec.
May 0 0 0 0 1 3 6 Nov.
Apr. 0 0 0 0 1 3 6 Oct.
Mar. 0 0 0 0 1 3 6 Sept.
Feb. 0 0 0 0 1 3 6 Aug.
11 10 9 8 7 6 A.M.
June 0 0 0 0 1 2 9 Dec.
May 0 0 0 0 1 2 10 Nov.
Apr. 0 0 0 0 1 2 Oct.
Mar. 0 0 0 0 1 3 Sept.
Feb. 0 0 0 0 1 3 Aug.
June 0 0 0 0 1 2 5 Dec.
May 0 0 0 0 1 2 6 Nov.
Apr. 0 0 0 0 1 2 10 Oct.
Feb. 0 0 0 1 1 4 Aug.
June 0 0 0 0 1 1 4 Dec.
May 0 0 0 0 1 1 4 Nov.
Apr. 0 0 0 0 1 2 7 Oct.
Mar. 0 0 0 1 1 3 Sept.
Feb. 0 0 0 1 2 6 Aug.
June 0 0 0 0 1 1 3 9 Dec.
May 0 0 0 0 1 1 3 Nov.
Apr. 0 0 0 0 1 2 6 Oct.
Mar. 0 0 0 1 1 4 Sept.
Feb. 1 1 1 1 3 10 Aug.
11 10 9 8 7 6 5 A.M.
June 0 0 0 0 1 1 2 5 Dec.
May 0 0 0 0 1 1 2 7 Nov.
Apr. 0 0 0 1 1 2 5 Oct.
Mar. 0 1 1 1 2 4 Sept.
Feb. 1 1 1 2 4 Aug.
June 0 0 0 0 1 1 2 3 6 Dec.
May 0 0 0 1 1 1 2 4 10 Nov.
Apr. 0 0 1 1 1 2 4 Oct.
Mar. 1 1 1 2 3 6 Sept.
Feb. 2 2 3 4 9 Aug.
June 0 0 0 1 1 1 2 2 3 5 7 9 10 Dec.
May 0 1 1 1 1 1 2 3 5 7 Nov.
Apr. 1 1 1 1 2 2 4 7 Oct.
Mar. 2 2 2 3 4 8 Sept.
Feb. 5 5 7 Aug.
11 10 9 8 7 6 5 4 3 2 1 A.M.
June 1 1 1 1 1 1 1 2 2 2 3 3 3 Dec.
May 1 1 1 1 1 1 2 2 3 3 4 4 4 Nov.
Apr. 2 2 2 2 2 3 4 5 7 9 Oct.
Mar. 4 4 5 6 8 Sept. Numerical values which characterize the atmospheric conditions indicated in Column 1.
approximately 90° from sun, measured through zenith. Atmospheric index, A, for various atmospheric conditions.